We’re suckers for puns and wordplays here at Peter’s, so we definitely got a kick out of Envirotrends' SPLASHitToMe Compact Kids Raincoats when we saw them! 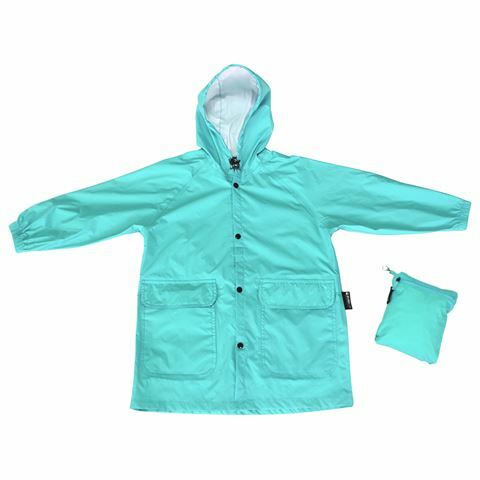 Look past the fun name, and you’ll find that these raincoats are highly practical and even comfy, unlike the traditional bright yellow trench coats you probably wore as a child. Made from high quality waterproof nylon and held together with heat sealed seams, they’ve been designed to keep your little ones dry, even during the inevitable after-school pick-up in torrential rain! So, they keep your kids dry. What else? SPLASHitToMe raincoats essentially stuff down in to their own pocket, so they’re easy for children to open and then stuff back inside their zip pouch. Once in this pouch, the raincoats are a perfect size to put in the bottom of a school bag or backpack. So go on – sock it to the rain, with SPLASHitToMe! Made from waterproof nylon, with heat sealed seams to keep you dry. Folds out of zip pocket to become a raincoat. Folds back down in to pocket for compact storage; just turn the pocket inside out and stuff the raincoat back inside. Perfect size for the bottom of your kid's school bag. Hand wash when required and line dry. Dimensions: 65cm long, 45cm width, 52cm sleeve length.